Place Ste-Foy is certified under the Go Green program administered by BOMA, an organization that assesses the environmental performance of property owners and managers. For many years, Place Ste-Foy has implemented various initiatives designed to achieve a 70% recycling target for paper, paperboard and glass. Clearly labelled plastic and glass recycling bins are available in the food court and throughout the centre. In addition, a range of operational systems have been developed and implemented to ensure more effective energy and water consumption. As part of our ongoing efforts to better serve our clientele and to protect the environment, we are proud to announce that four charging terminals have been installed in the Hochelaga parking lot and are now available for users of electric cars. Using their idVERTM, members of RéseauVER can recharge their electric car at the cost of $1.50 per hour. These stations are part of the network developed by AddÉnergie, Canadian charging station solution provider, which totals almost 90 public charging stations accross several cities in the province. 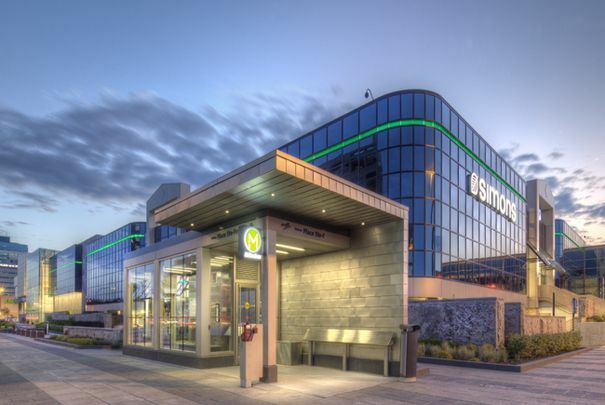 Since February 2011, Place Ste-Foy and the Réseau de transport de la Capitale (RTC) unveiled a new bus station, featuring a heating system that operates during the winter season. This means greater comfort and accessibility for users, particularly those with limited mobility. Place Ste-Foy built this bus station, ensuring its design is integrated with the new look of the centre and conforms to its environmental action plan, which has been in place for many years.